I got up the nerve to Tea-Dye "With My Needle" yesterday. I actually mixed in a little coffee with the tea and baked in the oven for about 20 minutes at 250. I think it turned out O.K. It wasn't difficult after I got over my initial nervousness. After dyeing WMN I decided to try to finish up another UFO, "It's Berry Time." I haven't worked on it since July! 40 ct. Vintage Maritime White, Belle Soie silk (1 over 2). I'm really hoping to finish it up in the next couple of days. 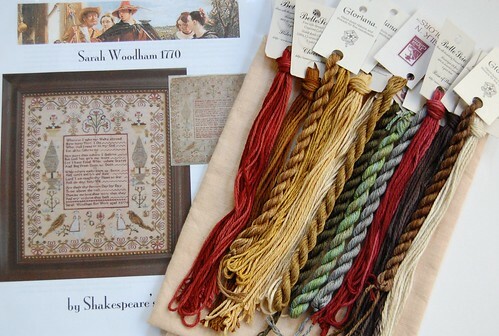 I also got a couple more threads I was needing for Shakespeare's Peddler "Sarah Woodham 1770." I just love this design! The fabric I'm thinking of using for it is 40 ct. Vintage Homespun. I could just stare the silks all day long. They are so pretty! I'm so glad Theresa has started doing reproductions - she has such a good eye for color! Write soon! Beautiful dyeing job, Nicole! I love your WMN! And yes, I'm glad Theresa has started doing repros too. I just love Sarah Woodham and lots of others as well! The dye job looks great! I love Theresa's things as well. Can't wait to see your progress as Sarah is on my wish list! I think that your tea dyeing came out perfectly Nicole! Just the right amount! I'd be scared to death to try it out, but perhaps one day I will. Those silks are to die for for Sarah. I ordered that too and so I'm looking forward to seeing your start on it! You did a great job with the tea/coffee dye. Those silks for Sarah look great too.... it would be hard for me not to start that sampler right away. Your tea/coffee dyeing looks great!!! With your speedy needles you will be sharing your Berry Time finish very soon. You are almost finished. It looks fabulous. Those silks are very pretty. I can't wait to see your start on this one. 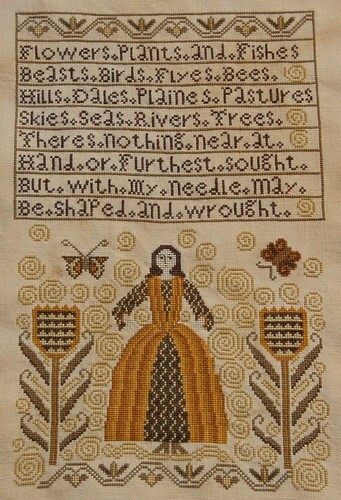 So far, I have resisted ordering this one, but I haven't seen anyone stitching it yet. I am looking forward to seeing your start/progress. I knew you could do it! Lovely job. Love the tea dyed WMN and the BBD piece is just gorgeous. Can't wait to see your start on Sarah Woodham. The colors are so pretty. Nicole, you did a fantatic dye job. I like that reproduction sampler as well. The staining turned out so well! Very nice. LOVE LOVE LOVE the tea and coffee dye! Hi, Nicole. Your WMN is a masterpiece! It would have scared the living daylight out of me to stain and then bake such a work of art. The result, though, is just perfect! Everything you stitch always looks so fantastic! I love Berry Time and look forward to seeing your finished product. Oh and my that looks lovely Nicole :) GOOD JOB! Great job with the tea dyeing, it looks really good. They look great! We are going to miss you in MB! I've been SUPER busy the past few days, but I think we're "almost" ready to go! Have fun in FL, talk to you when we both get home! Nicole it looks wonderful! I have not been brave enough to try it yet - but I may now! 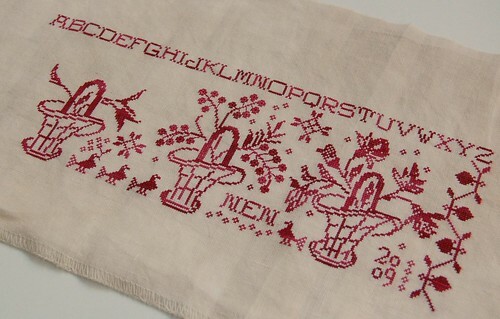 Berrytime is such a pretty piece - as much as I love the pattern, stitching with one color just bores me to tears. Oh, I just love Sarah - I am just waiting on my fabric to arrive. All of Theresa's designs are just wonderful! 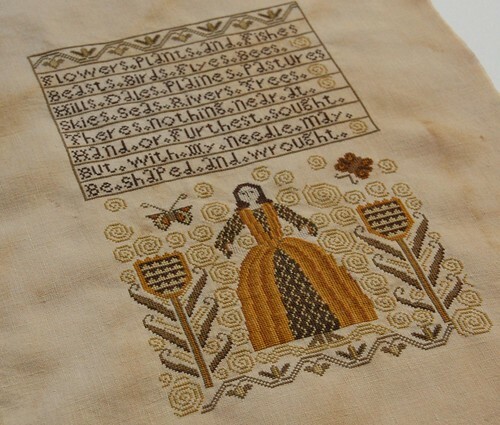 I think I asked you this before, but how do you get such great pics of your stitching? Do you take the pictures in actual daylight versus under a daylight lamp, for instance? Oey, you're KILLIN' me with all of these lovely finishes! I just don't know where to look next! As for the tea/coffee dyeing....you are a brave brave soul. The only time I manage to tea/coffee dye is when I spill my morning cup all over the Happy Chair! Lovely work! The dye job is great. Those silks are nummy, too! I just love how WMN turned out, tea-dyeing and all. What a gorgeous piece. The silks for Sarah Woodham are incredible. That'll be a really fun stitch. That pile of thread for Sarah is lovely! Love the dye job Nicole, it really looks good. Your tea dying has come up so well, Nicole! Bet you'll use this method more often now you've got some confidence with it? WMN looks gorgeous with the dye job, Berry time is looking lovely. Your tea and coffee dye job turned out beautifully. I like the aged look! The tea dyeing turned out perfectly! Congrats! what wonderful blog and wonderful job! !